I’m sure you have found yourself looking up at the night sky and wondering just how big the universe is. How could you not?! It’s just so vast, and we are just so tiny! It’s almost impossible not to ponder just how vast it really is, how far it reaches. I wish I could tell you exactly how big the universe is. But we don’t really know. I mean, not only do we not know, but the most logical guess you might make — based on all of the latest, highest-tech observations that we’ve made — turns out to be…. not even close. And the unknowability of the size of the universe comes from the fact that light takes time to get to us. The Sun, for example, is so far away from Earth that it takes light about 8 minutes to get here. So, when you look at the Sun — which you should never actually do, by the way — you’re seeing it the way it looked 8 minutes ago, when the light that’s now hitting your eyes left its surface. Then there’s Proxima Centauri, our nearest neighbor star. Light from there takes 4.2 years to get here, which is why we say it’s 4.2 light-years away. So we’re always seeing how it looked 4.2 years ago, not what it looks like now. So basically, the farther away you look into space, the farther back in time you’re seeing. Which is really cool when you think about it. Now, the first light in the universe that we’d be able to see, started traveling about 13.8 billion years ago — that’s around 300,000 years after the Big Bang. Before that, the universe was so dense that it was basically opaque. There was light, but it couldn’t get very far. So, we can only see as far as where that first visible light started traveling from — this is the edge of what’s called the observable universe. But here’s the thing: The universe is almost certainly bigger than the observable universe. Cosmologists think that there’s a lot more out there, beyond that edge, and if you could somehow see the rest of the universe, it would look pretty much the same as the observable one, with the same kinds of stars and planets and galaxies. It’s just so far away that its light hasn’t had a chance to reach us yet, even though it’s been traveling for billions of years. So, we know that there is more of the universe. But, again, nobody knows how much more. To get a little closer to understanding what’s all out there, let’s start with what we do know: How big is the observable universe, at least? From everything we were just talking about, you’d think that the observable universe would be basically a sphere that extends 13.8 billion light-years from Earth… because the universe is about 13.8 billion years old, so that’s how long that first light would have taken to reach us. By this reasoning, from end to end, the sphere would be twice that size — 27.6 billion light-years wide. But it’s not. Because, light might have left the edge of the observable universe 13.8 billion years ago, but by now, the spot where it came from is actually much farther away. OK… so how did that happen? It’s because of another endearingly fascinating trait of our universe: … it’s expanding. And fast. 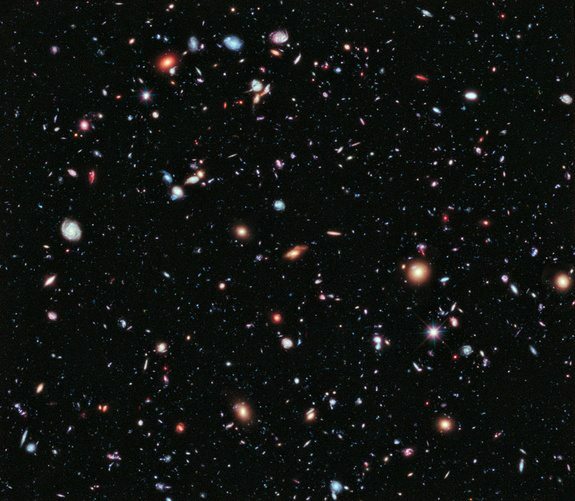 The photo was assembled by combining 10 years of NASA Hubble Space Telescope photographs. © NASA, ESA, G. Illingworth, D. Magee, and P. Oesch (University of California, Santa Cruz), R. Bouwens (Leiden University), and the HUDF09 Team. Everything in space is flying away from everything else, because space itself is expanding. It’s kind of like dots on a balloon, the farther away the dots are from each other, the more the space between them expands as the balloon inflates. So, we might be seeing light that’s been traveling for 13 billion years, but during that time, its source has moved much farther away from us. Astronomers can figure out how far, because light that’s traveling toward us through expanding space will be shifted toward the redder end of the spectrum. And that is how we know that, even though light left the edge of the observable universe 13.8 billion years ago, that spot is now 46 billion light-years from us. Which means that the observable universe is twice as big across, 92 billion light-years wide. So, all of this has left us able to see only a tiny part of the universe, with no real sense of how far it goes. Which is why you’ll hear all kinds of mind-blowing ideas about what the universe might be like, maybe it’s infinite, maybe it isn’t, maybe there are actually LOTS of universes and we’re just living one version of the infinite variations of history. We simply don’t know what’s out there, and we probably never will, because most of the light out there, beyond the edge of observability, will never reach us. The universe is just expanding too quickly, past a certain point, everything is moving away from us faster than the speed of light. And for us, light equals information. Without it, we are just … left in the dark. So, What do you think? Does the Universe go on for ever? Tell us in the comments below.